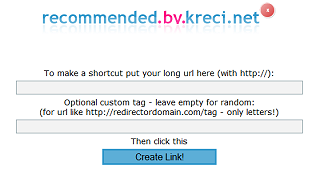 Some of you might think in this place about some free url shortening services like bit.ly or tinyurl. Sure it would work - but it is not looking as trustworthy for your visitors. It makes them sure that such link will redirect them... nobody knows where. Probably it would be even worser that real affiliate links. So how can you do it? I can recommend you a free script called MiniUrlz. You may set it up in no more than 3 minutes. It is url shortening script that may be used for your affiliate links as well. It don't even need MySQL database! You manage the admin area so you may be sure your links won't be modified as it may happen in some public redirecting services. With this solution you stay on your own server and domain. In my case my affiliate links clicks have increased over 30% (my earnings about 15%). I believe it is really worth to spend 3 minutes for such big earnings increase. Have you set up your own affiliate domain? Please share your ideas for catchy subdomains in the comments.